Davidson Budget: It's time to cut the Mi-Connection tax! Since its inception, the decision by Davidson and Mooresville to form a cable company has been an unmitigated financial disaster for the towns. The impacts of the company (originally called Mi-Connection and now Continuum) on town budgets has been particularly acute in Davidson where it has been the primary driver for the town having property tax rates as much as 40% higher than its neighbors and a solid waste fee (aka the trash fee, aka the Mi-Connection tax) of $201 where the fee in Huntersville is just $72 and the fee in Cornelius is zero. The solid waste fee is particularly onerous and has been a wound salting consequence of the Mi-Connection decision. It is a regressive fee, hitting low income residents harder than others. Also, it was not implemented correctly, and people who qualified for exemptions did not receive them - a fact recently uncovered by Save Davidson. The fee implemented in FY2011 came at the height if Mi-Connection subsidies when these subsidies reached nearly a quarter of the overall general fund budget. Prior to the fee, trash service was included in the property taxes levied by the town. Once implemented, the fee freed up money in the Town general fund that has been diverted to paying these cable company subsidies. With Town coffers full and the Town proposing a FY2019 budget including a 7.15% spending increase, now is time for Davidson's new Board to cut this Mi-Connection tax. This can be done - easily. Taxpayers also need to understand this. If taxes aren't cut when times are good, they never will be. Where would this money come from in the new budget? The Town is sitting on millions in taxpayer money held in various pools called fund balances. Check the latest Finance Department numbers here. The proposed budget also includes $400,000 towards the Public Facilities capital improvement fund. This is the fund for the new Town Hall. Town staff described putting this extra money aside as a way to "carve" a place in the budget for future debt payments on this project. Here is the thing about such carving. Besides the fact it us being carved out of your wallet, it is for debt the town has not even agreed to take on yet. This Board has strongly indicated they want this project debt to go before the voters in a referendum this fall. Putting a carve out for this debt in the budget now totally undermines the spirit of putting the question before the voters. Rather than doing this carve out and making a sham of a potential November referendum, the Town should use this $400,000 in excess money to cut the solid waste fee in half. This would bring the fee to $100 per single family household - making it more in line with Huntersville which is currently at $72. Importantly, this could be done while still fully funding the needed increases to Fire and Police included in the proposed budget. It also doesn't touch the fund balance in the solid waste fund which currently sits at roughly 40% of annual solid waste expenses. Cutting this fee now is the right thing to do. It would show the new Board is serious about addressing the Mi-Connection (Continuum) issue and its impact on the town. It would show the Board is serious about addressing affordability by reducing a regressive fee. It would show the Board is serious about truly listening to the voters before making capital spending decisions like those for a new Town Hall. Here's hoping the Board takes these things seriously. 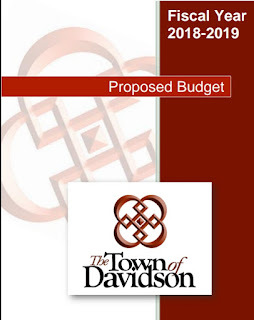 Readers can contact the Board at Board@townofdavidson.org to ask them about the budget. The public hearing on the budget is set for next week at the May 8th Board meeting. Since bursting on the scene a year ago, Save Davidson has become an mainstay in the discussion on local issues in Mecklenburg County's northermost town. 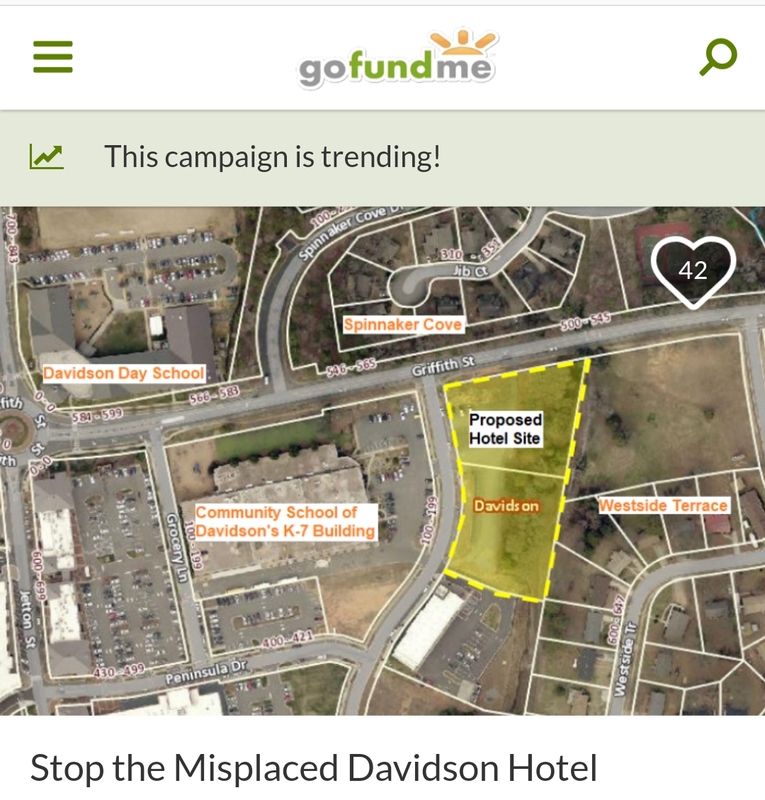 The group got its start by spearheading efforts to stop the Town of Davidson from selling (cheaply) public land intended for a park to a private developer for extravagant luxury condos. It was basically an "eminent domain" situation where the government was taking land from every Davidson citizen for the primary benefit of a private developer. Now, there is a popular indie film out covering this exact topic, and Save Davidson is bringing it to town. If you are involved in local activism in any way you will want to see this film. Get your tickets now!! The $20 ticket includes the movie and concessions as well as Q&A. 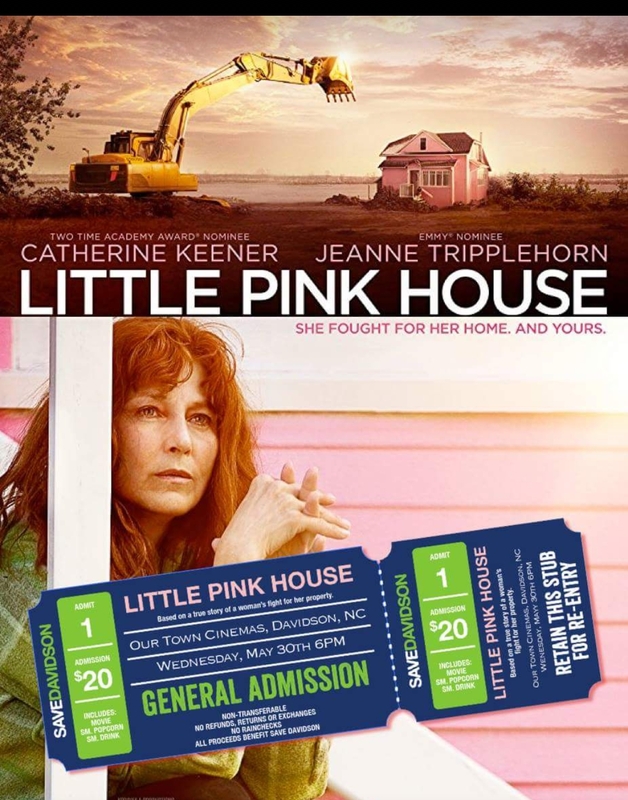 According to Save Davidson leader, Denise Beall, as of Thursday more than half of the tickets have already sold for the May 30th event at Our Town Theaters, leaving about 30 seats left. Act now if you are interested in going. Tickets can be purchased at the Save Davidson Store. Join Save Davidson for a private viewing of Blockbuster indie film “Little Pink House”—a David and Goliath, Government meets minuscule but fierce citizen resistance—just released to a packed house in New London, Conn., has a show date in Davidson. At 6:30 p.m. on May 30 at Our Town Cinemas in Davidson, Save Davidson will begin the program with a brief introduction by the leadership team and movie will begin at 7 p.m. followed by a 30 minute Q&A. Your ticket stub gains entry and one small popcorn and one small soda. Focusing on Susette Kelo’s ultimately losing challenge to keep her house, doomed by government’s revitalization plan for a Pfizer factory and 1,000 jobs, eminent domain and its purveyors are the bad guys. A shy nurse, who wanted only to protect her “dream home” is the heroine. Any citizen, anywhere—including Davidson’s neighborhoods—may be subject to a “greater good” argument by government. “Little Pink House” celebrates the strength of principle that propelled Suzette Kelo to fight all the way to Washington, D.C. for her finally bulldozed neighborhood. In the ultimate irony 13 years later the proposed facility remains unbuilt and the land lies empty. 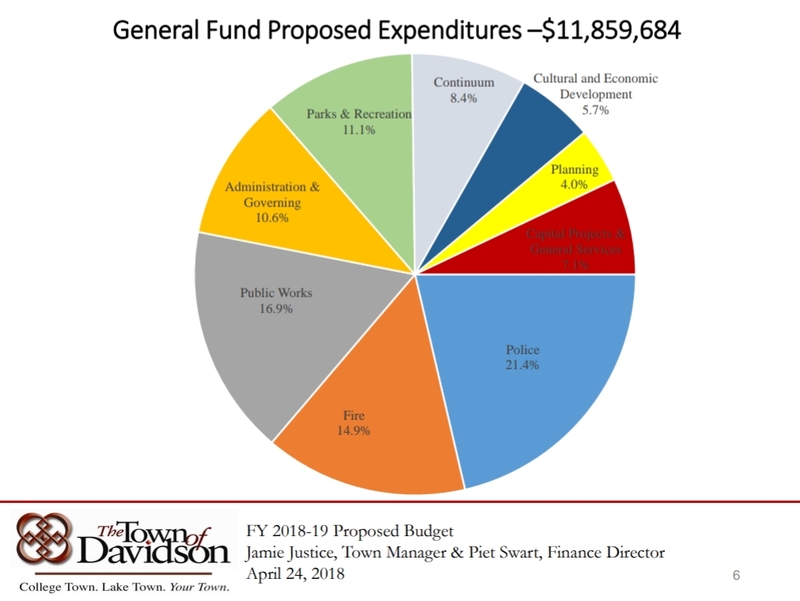 Tuesday night, Davidson taxpayers got the first glimpse of spending plans for the upcoming fiscal year that starts July 1st. With strong economic growth expected, the budget plans to keep the property tax rate even at 35 cents. That results in the Town bringing in significantly more "revenue". This year each penny on the tax rate equates to $202,000 in taxes to the town. Keeping the rate as-is means Davidson continues to have a rate significantly higher than its neighbors. Not many people these days get a "raise" of more than 3%, but next year's ToD budget plans to see spending going up more than 7%. That is a pretty eye popping number when one considers it doesn't include much if any of the biggest spending items related to the bonds passed last November OR spending related to the new public facilities being planned. If/when all that spending kicks in over the coming years along with the 2019 property revaluation one can expect higher tax bills as well. While a 7% general fund increase is a big number, the bulk of the new spending is for much needed additional capacity for the the Town's Public Safety departments, meaning Fire and Police service. Those are both areas where additional spending is needed and required. With the opening of Fire Station #2 imminent, spending for fire service will rise 21.3% to $1,763,477. This is driven by increased staffing and equipment needs as well as debt service on the new fire station itself. The Town has just announced the grand opening of Fire Station #2 is set for June 9th. See this Facebook event for more details. The Davidson Police department budget is planning for a 14.4% increase to $2,533,171. This is driven primarily by increases in staffing. The DPD is often short handed with only 2 officers on duty on some shifts. 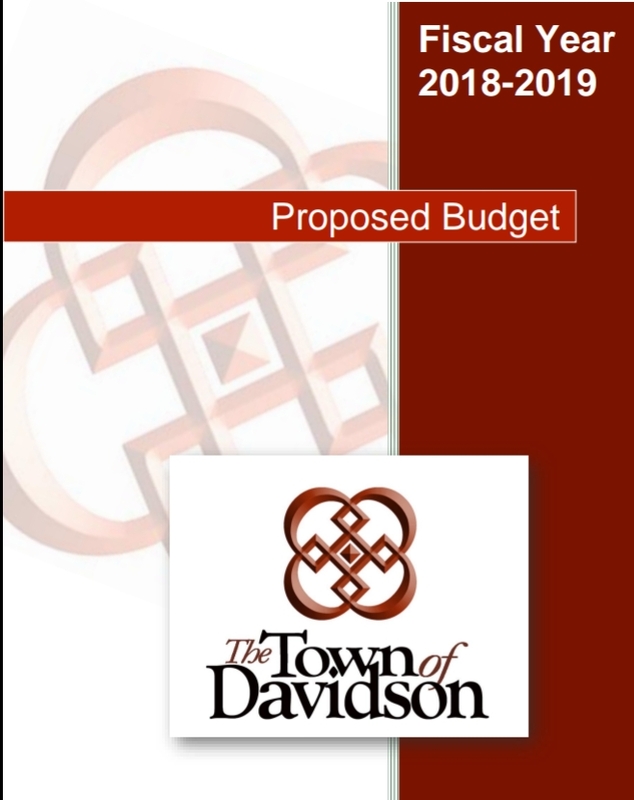 Three new officer positions are included in this budget, two sergeant positions and one SRO (School Resource Officer) in partnership with the Community School of Davidson. Regarding the SRO position at CSD, Police Chief Penny Dunn said "we are still working on details with CSD at this point on a proposed SRO to work with their campuses. A SRO is an employee of a town/city as a police officer with assignment to a campus during the school year. Schools partner with a town or city government to fund the position costs." Since public safety is local government's top priority, it is good to see the town addressing these areas. A 3% merit pool is included for pay increases. This is not a blanket 3% raise for all employees, but a pool that will be divided based on merit. Continuum continues to drain $1 million from the budget on an annual basis. Solid waste budget was not presented as the Town is in the process of bidding out the service, something that happens every 5 years. Solid waste is covered by the Town's $201 solid waste fee. $400,000 was set aside in a "capital projects" fund for future spending. The budget must be passed by state statue before the current fiscal year runs out. This means the Board has relatively little time to review before a scheduled June 12th vote. The public hearing on spending plans is scheduled for May 8th. 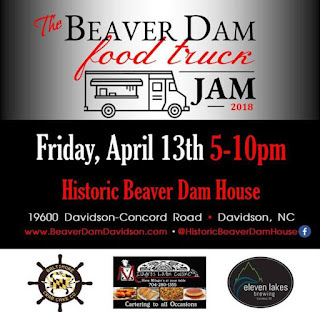 DAVIDSON, NC – The Town of Davidson is pleased to announce our “Davidson Community Dinner – Breaking Bread, Building Friendships” event on Friday, May 4 from 5:00 to 8:00 p.m. in the parking lot next to the Davidson Fire Department (entrance on Jackson Street). All members of our community are encouraged to attend. And attendees are encouraged to bring a dish to share (including a serving utensil). We will have tables set up for a buffet and tables and chairs for attendees. We encourage you to meet and greet old and new friends. If the weather is inclement, we will move the BBQ to the Davidson Town Hall board room and invite citizens to pick up a plate. For more information, please contact Mayor Rusty Knox atrknox@townofdavidson.org or Kim Fleming at kfleming@townofdavidson.org. DAVIDSON, N.C – Community members are invited to meet with the Planning Board Ordinance Committee (PBOC) to ask questions about the proposed changes to the watershed ordinance. The PBOC drop-in session will be held on Monday, April 30 from 4:30 to 6:30 p.m. in the Davidson Town Hall board room. All are invited to attend. 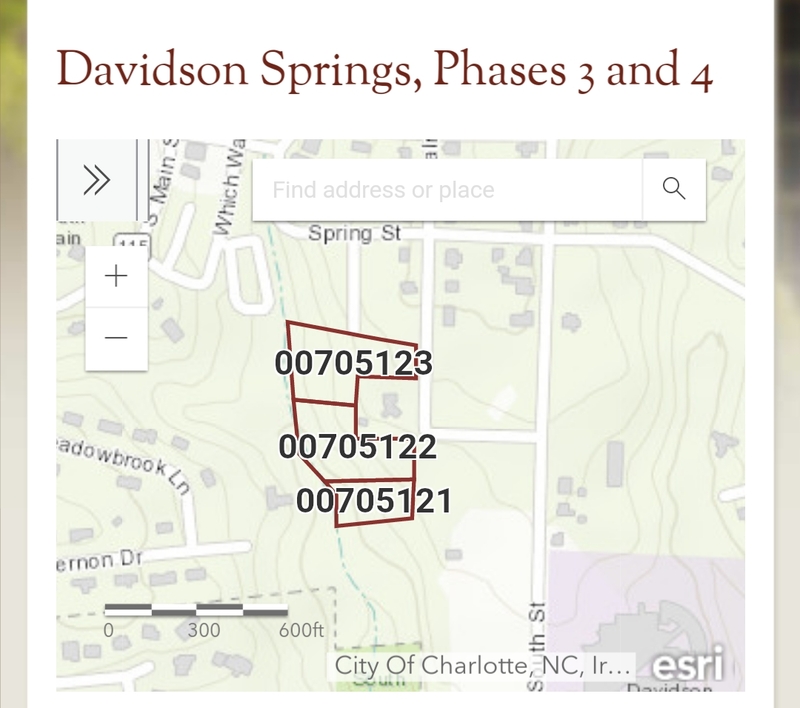 Staff have been working with planning board members, citizens, and the board of commissioners to draft text revisions to Section 17 of the Davidson Planning Ordinance (DPO), whose regulations govern parcels within town near Lake Norman. The standards apply to properties within 0.5 mi. of the lake (i.e. the "critical area"), which is generally everything west of Main Street because topographically, water flows in that direction. The standards, in place since 1993, maintain clean water in Lake Norman by requiringvegetative buffers and limiting the amount of "built-upon-area" (BUA) placed on a lot, residential or non-residential.The fewer buffers and more BUA a lot contains, then the more runoff containing dirt, fertilizer, chemicals from cars, etc. washes off onto our streets and gets into the lake. BUA is hardscape surfaces like a driveway or building footprint; it is not things like fences or decks that have grass underneath. Reinforcing the character of existing streets and buildings. For expansions to existing structures in the critical area of the watershed, we’d like to require enhancements to encourage rain water management on-site such as rain gardens and French drains. Remove exemptions for lots of record; we had hoped to allow long-standing owners prior to 1993 to be exempt from built-upon area limits, but we cannot make ordinances based on tenure. Since our downtown is in the critical area of the watershed, we’d like to make an amendment that allows for flexibility in meeting watershed requirements on the block bounded by Main/Depot/Jackson Streets. Increase the authority of our board of adjustment when they are approached with built-upon area averaging cases. Citizen feedback received by the PBOC the past several months has been instrumental in improving the proposed amendments. In fact, most revisions over this period have come directly from citizen input. For more information about the proposed text amendments, please see the town’s text amendment webpage (http://www.townofdavidson.org/textamendments. Additionally, citizens are invited to contact Planning Technician Lindsay Laird in the planning department atllaird@townofdavidson.org with specific questions. A public hearing is scheduled for the board of commissioners regular meeting on May 8. The Davidson Board of Commissioners could consider a vote at a future meeting. Want to know if your property is in the watershed? 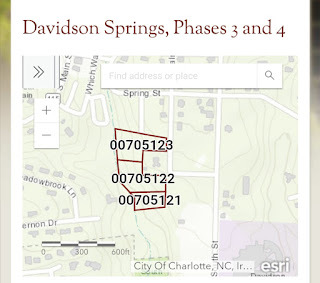 See Mecklenburg County’s Polaris 3G website (http://polaris3g.mecklenburgcountync.gov/), type an address into the search bar, and scroll down the left side of the page to “Environmental Information” – if the field next to the row saying “Regulated Drinking Watershed Class” says “CA” then that means the property is located within the critical area of the watershed and subject to the ordinance. Note: Not all of the ordinance’s rules affect every property – there are many unique circumstances! It’s not often that a town has the opportunity to restore not only a piece of history, but also a piece of the community. 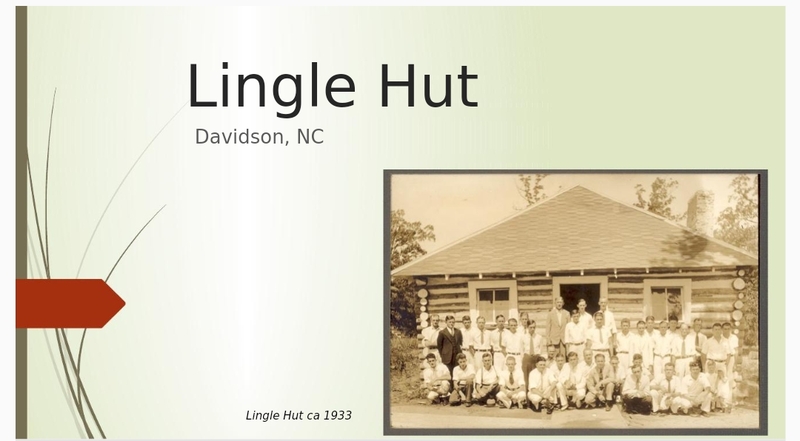 The Lingle Hut, part of Reeves Temple AME Zion church in Davidson, is one of those opportunities. Cornelius Commissioner Kurt Naas has been working on gathering support for the project, and aShortChronicle reached out to see what information he might be able to provide. Here's what Naas was able to pass along. “The Hut”, as the congregation refers to it, was built in 1932 as part of Mill Chapel (later renamed Unity Church). From the Great Depression to the 1960’s the church served blue collar workers on Davidson’s west side. 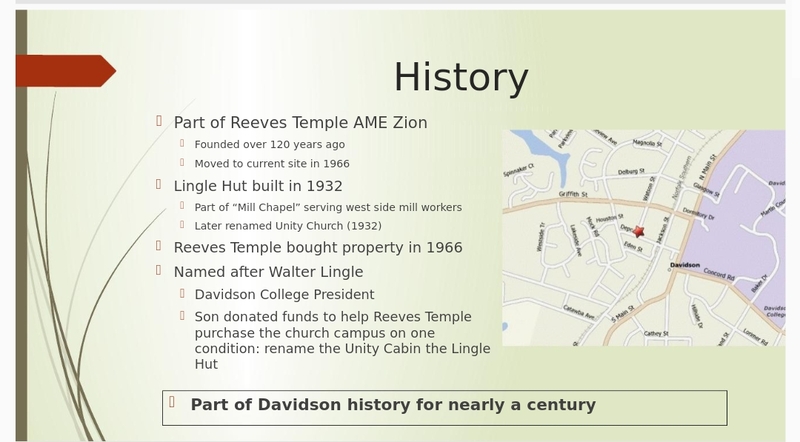 In true Davidson fashion it was built by the community- no contractor, no architect. Men cut timber and women stripped bark, and in the depths of the Great Depression they built something that lasted nearly a century. It was known as the “Unity Hut” until Reeves Temple bought the site in 1966 with help from the son of former Davidson College President Walter Lingle. The younger Lingle donated funds with one condition: that the Unity Hut be named in honor of his father. 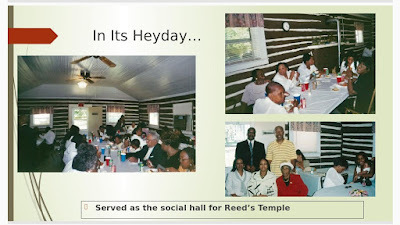 For the next fifty years the Lingle Hut served as the social hall for Reeves Temple. 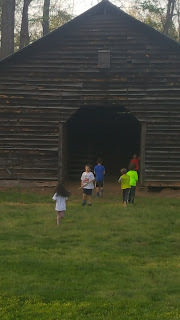 As the congregation aged and children moved away membership declined, and the Hut fell into disrepair. It has been unusable since 2014 and is in danger of collapse. 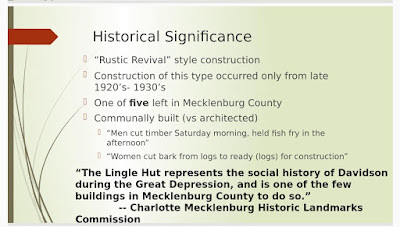 Built in a “rustic revival” style of architecture, the Lingle Hut is one of only five such structures remaining in Mecklenburg County. 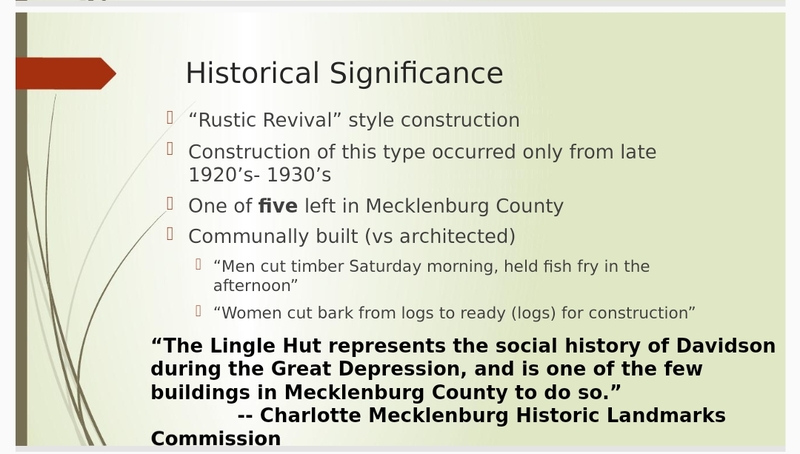 Recognizing this, the Mecklenburg Historical Landmarks Commission designated it an “historically significant” site in 2007. Naas became aware of the plight of the Lingle Hut through Lela Johnson, a 90-year-old Davidson native a lifelong member of Reeves Temple. 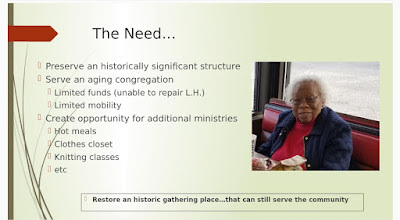 Johnson, along with the rest of the congregants, would very much like to see this key part of their past restored for the benefit of future generations. Naas and his wife Maria are assisting with publicity because they feel it represents a unique opportunity to restore not just a piece of history but also a piece of community. For those interested in helping, Reeves Temple will be holding a kickoff meeting at the church on 219 Watson Street on Sunday, April 29th from 4-5pm See this Facebook event for more details. On of the controversial items left over from the previous Davidson Board was the idea of spending millions on a new Town Hall and public safety facilities without putting the decision before the voters. Fortunately for taxpayers who absolutely deserve a right to vote on this type of large expenditure, the new Board put that idea on hold for 90 days while it investigated other options. 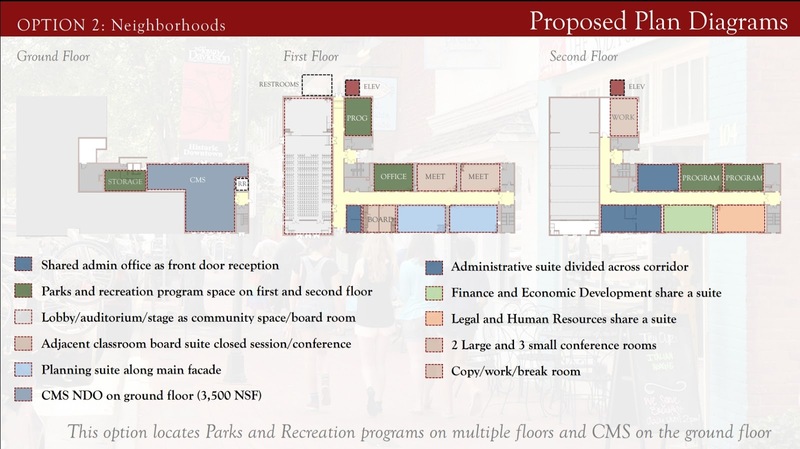 Now, a little mote than 60 days into that "pause" details of a new plan to possibly sign a long term lease with CMS and revitalize the old Davidson IB School on South Street turning it into Town and CMS offices is starting to take shape. Costs for these options will not be presented but according to the documents available, they will also consider renovations to the gymnasium on the site. 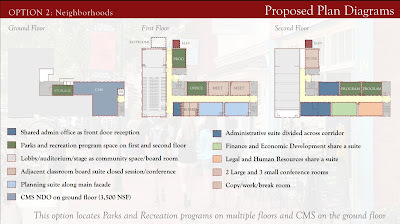 That would be a significantly positive addition to the original plans for puting these facilities on Main Street. April 24, 2018 Creech and Associates present results of Phase I: "test-fit" sketches. Consider funding for Phase II. May 22, 2018 Creech and Associates present results of Phase II: mechanical/structural assessments for board information. After several more steps in addition to those outlined above, this would set the stage for a GO Bond vote in November to advance the project. 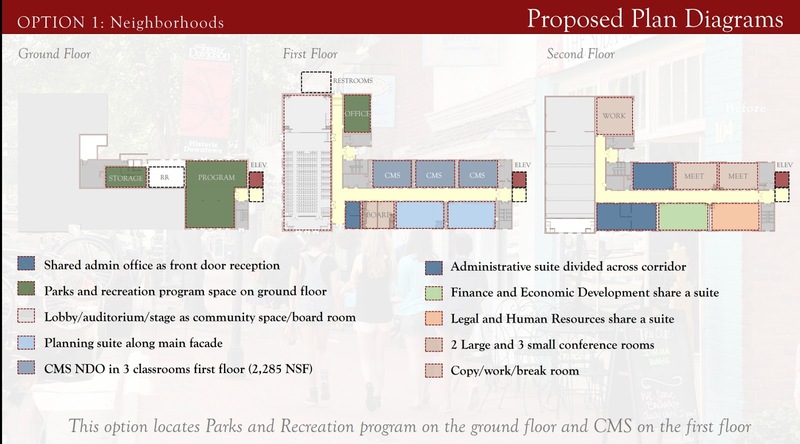 Assuming all deadlines are met for a November bond vote and that they pass, preliminary construction dates would have renovations on the South Street site complete by June 2020 with the existing Town Hall renovated for public safety by April 2021. Plaintiffs seeking to reverse the lame duck decision by former Commissioners Beth Cashion, Rodney Graham, Brian Jenest and Stacey Anderson approving a new hotel on Griffith Street had their first day in court on Tuesday. At an afternoon hearing, motions were heard on efforts by both sides to jockey for position ahead of a motion for a "judgement on the pleadings" now set for May 22nd. Three motions were heard Tuesday. Plaintiffs sought to have the case designated as "exceptional" which would allow the case to be heard in its entirety by a single judge rather than having the various proceedings heard by different judges. There is a shortage of such judges to handle these exceptional cases and therefore this motion was denied - a not unexpected outcome under the circumstances. Defendant Nish Patel, the developer, sought to have himself removed from the case individually, while his firm Beacon IMG remains as a defendant. Patel was listed separately as a defendant due to how some paperwork was signed during the zoning process being contested. The judge allowed this removal with conditions, but at this time it is unclear if those conditions will be met. In any event, like the first motion this has no bearing on the merits of the case. The third motion involved the addition of new plaintiffs to the case. As regular readers will remember, 24 plaintiffs filed originally from the Westside and Spinnaker Cove neighborhoods. 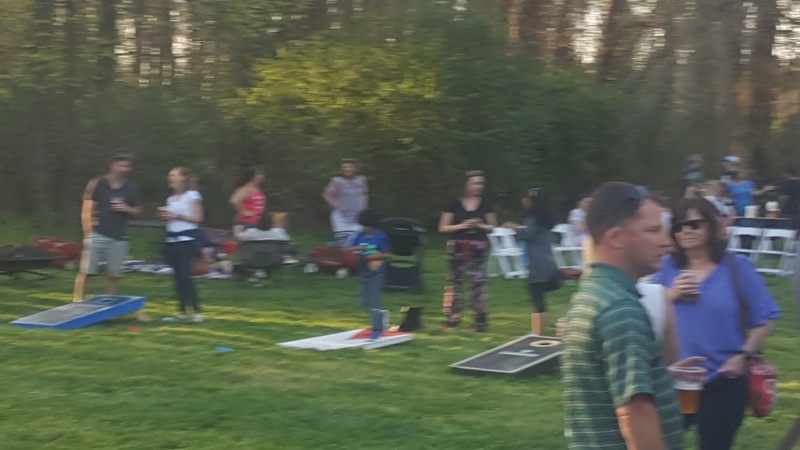 Residents in these neighborhoods are concerned about a hotel that will loom over their backyards, negatively impacting home values and their quality of life. The original complaint was filed on the last day possible under NC law. The statute of limitations in North Carolina zoning cases is extremely short. At just 60 days, it is among the shortest for bringing civil actions. This compressed timeframe unsurprisingly resulted in some residents wishing to join after filing. While these added plaintiffs could have been allowed, in a disappointing move that again does not speak to the merits of the case, the developer's attorney sought to have these additional plaintiffs thrown out. It's a move that does little but rub salt in the wound of people trying to defend their homes. After both sides made their arguments and cited cases in their favor, Judge Hugh Lewis decided not to allow the addition of new plaintiffs in this one. Tuesday's actions did not change the general direction of the case one way or the other, but the move to disallow new plaintiffs did show the developer's willingness to fight mercilessly for what it wants - a hotel very few people in town see as appropriate for that location. The next scheduled court date is May 22nd. Stay tuned for more details on this story as they emerge. If you are interested in donating to support the plaintiffs and Davidson's small town character, click HERE. DAVIDSON, N.C. –The Town of Davidson and the Green Davidson community group invite citizens to the Earth Day Fair on Saturday, April 21 from 9:00 a.m. to noon at the Davidson Farmer’s Market (behind Summit Coffee and adjacent to town hall). Earth Day is celebrated annually around the world on April 22. The Earth Day fair will include an E-Waste Recycling Drive to benefit E2D. The mission of E2D is to ensure all students have access to essential technology at home. This is a student-led community service project working to bridge the electronic divide through recycling. Bring your laptop computers, cell phones, and printers to donate for this great cause. Televisions and monitors will not be accepted at this event. Support the Bike/Walk to the Market Challenge by traveling “carbon free” or taking public transit to the event. You’ll earn a Farmer’s Market Buck. Stop by the Green Davidson booth for your prize. Visit www.townofdavidson.org/bikemonth to learn more about National Bike Month events. Register for the community bike ride or Tour de Trees at www.townofdavidson.org/dpr. Please call Davidson Parks and Recreation at 704-892-3349 for more information. Town of Davidson community members, elected officials and staff had a lively dialogue at The Egg on Monday night. 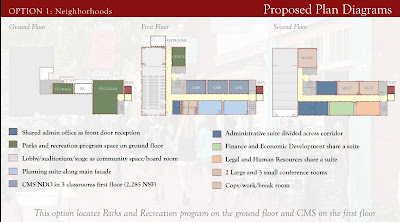 Affordable housing, IB School/Town Hall renovation, Ten-Foot Paths, asbestos, Potts Development and the Potts/Sloan/Beaty Connection (PSB) were hot topics, but the watershed text amendments stole the spotlight. A citizen asked if there is a more simple way to address affordable housing. Commissioner Jane Campbell said the board is looking at many different ways to use the money from developers who make payments in lieu of building affordable homes. Commissioners Matthew Fort and Campbell said the town is in discussions with Charlotte Mecklenburg Schools (CMS) about using the old IB School on South Street for Town Hall space. 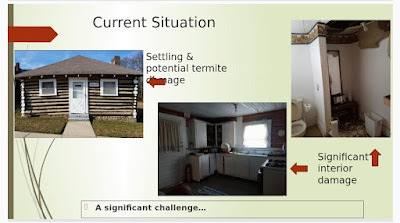 One possibility is a long-term lease. Several Potts Street residents said they received notices in the mail from a Raleigh attorney who is seeking to represent them in the “taking” (eminent domain) of their front yards for the proposed ten-foot multi-use path. Campbell said that she would request at least 30 days notice, allowing public comment, before the board considered the path. Town Manager Jamie Justice said engineers are working on the design phase that may be completed in spring or summer. Several citizens expressed concern that the PSB connection at Potts/Sloan would disturb asbestos. A citizen questioned the logic of allowing the Potts Development (approximately 300 apartments) to be approved, whereas the development depends on NCDOT Projects U-5873 and U-5907, which may or may not happen. She said that even when the two projects were included in the Transportation Impact Analysis (TIA), the project still failed at several intersections. She asked what would happen if the toll road project was completed and the contract was deleted -- whether the I-77 Toll Road Bonus Allocation funds would then disappear. Fort said they do not know what would happen. Justice said Crescent is still disagreeing with the town about the TIA results. A citizen asked that the board only vote on the county-driven watershed text amendments (rather than town planning staff-driven text amendments). Fort said that was something to consider. The citizen said there are nearly 30 text amendments and it would be concerning for the board to vote on all 30 as package deal. She said some of the text amendments are by omission. She provided an example: the requirement for a wet detention pond in the critical watershed is omitted, which would permit a project like Crescent/Potts Development to build more density. W - West Side Properties will be devalued. A - Area (Built Upon Area) is 24% for single-family homes and 50% for high density developers. T - The single-family homeowner can only build on 24% of their property (the number includes the OVERHANG of their roof!) The mill homes were not designed to last over 100 years. The text amendments are unfair to the mill home homeowners. E - An example is on Delburg. A 700 square-foot home is surrounded by new, large, well-over 24% impervious, 3,300 square foot homes. The long-standing homeowner (30 years!) will only be able to build a tiny house with an attached garage. R - Real estate. Will the West Side homeowners pay lower taxes after the Town of Davidson devalues their homes? S - Single-family homeowners can only build on 24% of their property, but developers can build on 50%. H - Heads up! Does anyone know about this? Have you sent a notice? Have you sent an email? Have you held information sessions? E - Egregious, disastrous change for the West Side! D - This will encourage new, high-density development that does not fit with the character of mill home neighborhoods. Griffith Hotel: Where do Davidson's corporate citizens stand? Channel 9 News did a story last week that shows in stark terms what the proposed new hotel on Griffith Street means to nearby residents. It means putting a hotel over someone's back yard looking at their child's swing set. It means increased gentrification and pressure on a vulnerable neighborhood. It means forcing citizens to be pitted against the town they love. And why is this being done? Of course the answer is money. It is always money. Immediately after the November 14th lame duck approval by Davidson's outgoing Board, hotel developer Nish Patel was quoted by Bisnow.com on why his firm was interested in Davidson. Beacon President Nish Patel said his company is focused heavily on hospitality in Davidson in particular, as its high barrier to entry means competitors will have a harder time breaking into the market. So, let's be really clear. This hotel has nothing to do with walkability or land use or parking standards or any of the other nonsense the Davidson Planning Department and former Commissioners would have you believe. It has nothing to do with doing what is right for the town or its citizens. It is about protecting a developer's investment. By "demand generators", the developer means Davidson's corporate citizens: Davidson College, MSC, Sherwin-Williams, Ingersoll Rand, and Lowes. These are the entities where the developer plans to mine his money. In fact, the developer's zoning attorney used many of these institutions in her sales pitch to the Town to gain the project's approval. Now that it is clear what this hotel means to the community and why the developer wants it so badly, do these corporate citizens stand behind it? Do they stand for hotel guests overlooking swing sets? Do they stand for gentrification? All to put more money in a developer's pocket? The PR departments of these types of institutions don't like answering these types of questions. They say things like "XYZ Corp does not take a position on local zoning matters." The time for that is over. The developer has used them repeatedly as his reason for this hotel in this location. The public deserves to know if these institutions approve of that and support the outcomes of this project. Now is the time for Davidson College, MSC, Sherwin-Williams, Ingersoll Rand, and Lowes to answer. Do they support this hotel in this location knowing the consequences of their support? Will they commit to not using the new Hyatt Place if it is built? Please contact these entities at the below addresses and ask them. Let them know their silence is acceptance and that that is no longer acceptable. Be polite, but let them know you as citizens of the town are watching for their response. Also, as reported earlier, the new Davidson Board of Commissioners is on record in the Town's court filings saying they were "opposed to the decision to approve the application for a conditional amendment to the master plan for a hotel". 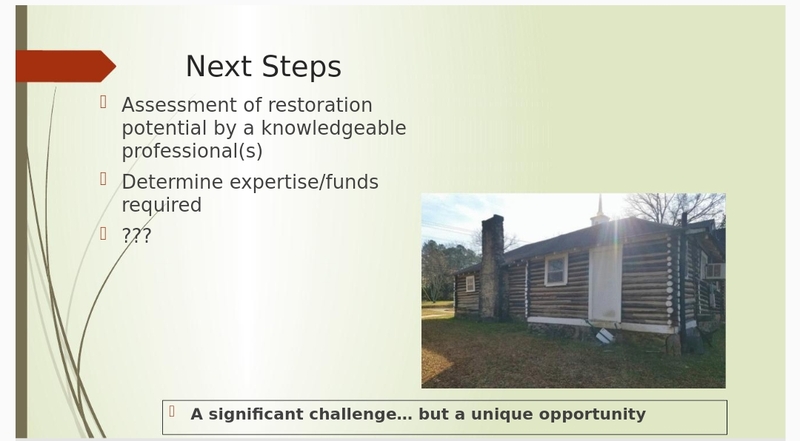 Citizens should ask the current Board to pass a resolution or take some other concrete step to ensure our local businesses and institutions know this location is not what is good for the town. The entire Board can be reached at Board@townofdavidson.org. At its April 10 meeting, the Davidson Board of Commissioners established a “Park at Beaty Street Task Force.” The board of commissioners will accept applications to serve on the citizen task force through April 30 and will make appointments to the citizen task force in early May. For more information and to apply, please visit www.townofdavidson.org/ParkatBeatyStTF. Kathryn Spatz, Parks & Recreation Director for the town, will serve as primary staff liaison for the task force. Please contact Kathryn at 704-940-9644, kspatz@townofdavidson.org for more information regarding the task force’s work and schedule. Davidson Town Hall will be coordinating two events Monday evening that both interest citizens. There will be a meeting at Town Hall as part of the Mobility Plan work currently underway as well as an evening version of the Coffee Chat with elected officials at The Egg. The Mobility Plan meeting starts at 6pm and will cover: Innovative Technology and Transit. Attendees will hear a presentations on innovative transportation technology, the offerings of the Charlotte Area Transit System (CATS), and an update on the Davidson trolley. After the presentation, there will be a question and answer session. That's per the press release put out by Town Hall. If readers are interested in bikesharing they may want to attend this one as that would likely fall under the "innovative" category and per previous inquiries with Town Hall, assessing bikesharing will be a part of the Mobility Plan. The Coffee Chat meeting starts at 630pm at The Egg. These monthly informal meetings held on the 3rd Monday with elected officials allow citizens an opportunity to interact directly with their representatives. 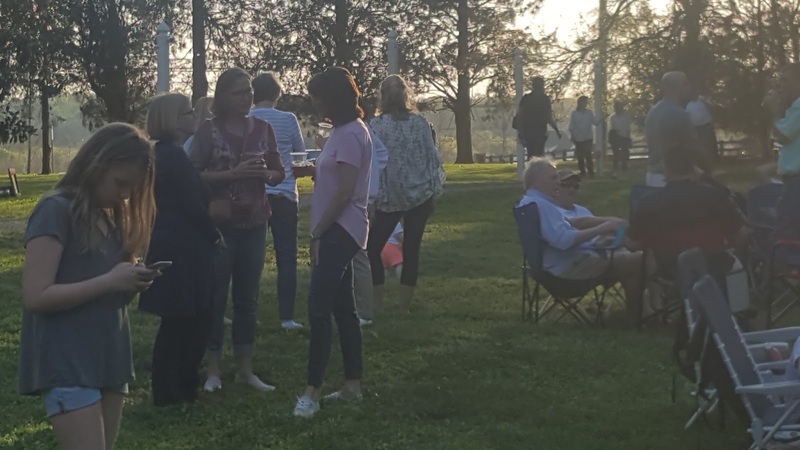 These events have often become well attended and lively discussions over the past year as the town has worked through some controversial topics. Both events will be live streamed and available for viewing at a later date via the Town website. Per the Town, efforts will be made in the future to avoid these scheduling conflicts. 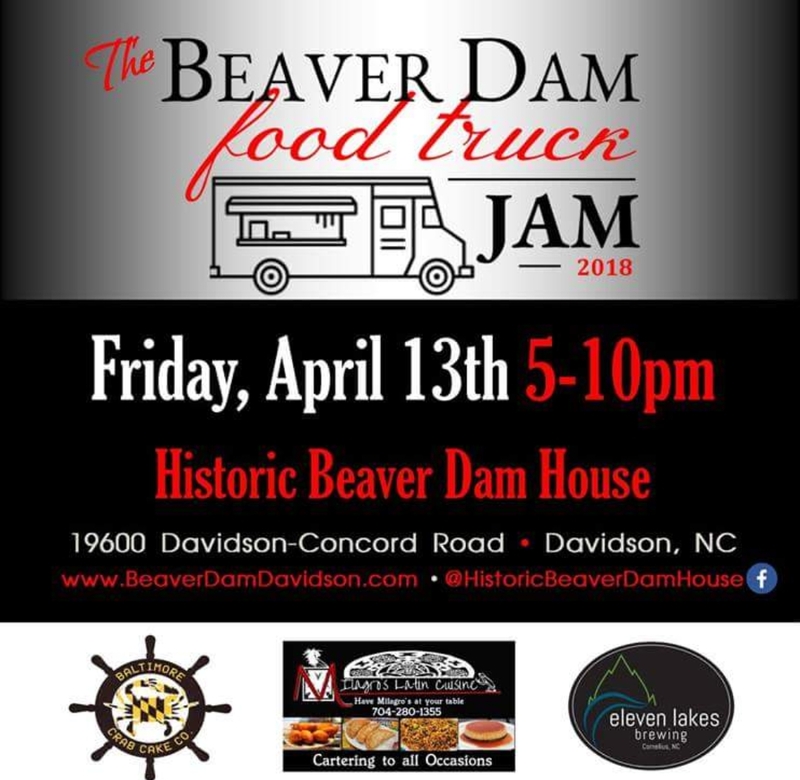 Davidson Town Hall rarely uses the Town owned Beaver Dam property off of Davidson-Concord Rd for community events, favoring the Town Green in downtown for such things. 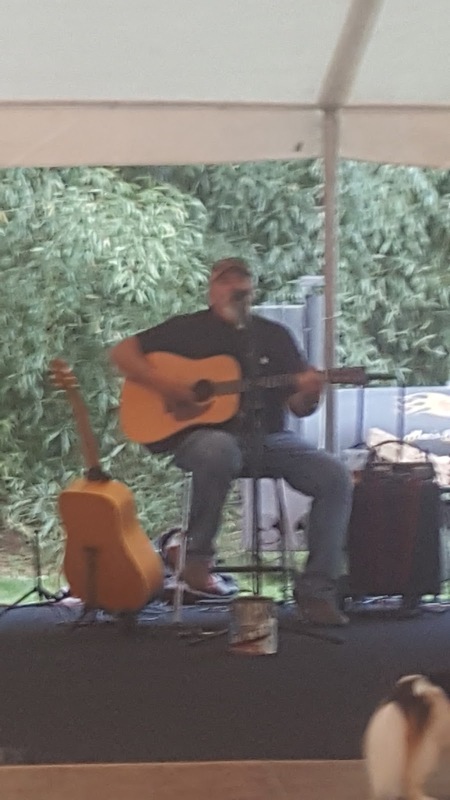 That changed Friday night with the inaugural "Food Truck Jam at Beaver Dam" held at the property. While there were some logistical problems with a couple of the vendors (something not unexpected for a first time event), it would be hard to describe the evening as anything but a major success. BBQ and Crabcake vendors were on hand as well as beer provided from Seven Lakes brewery. 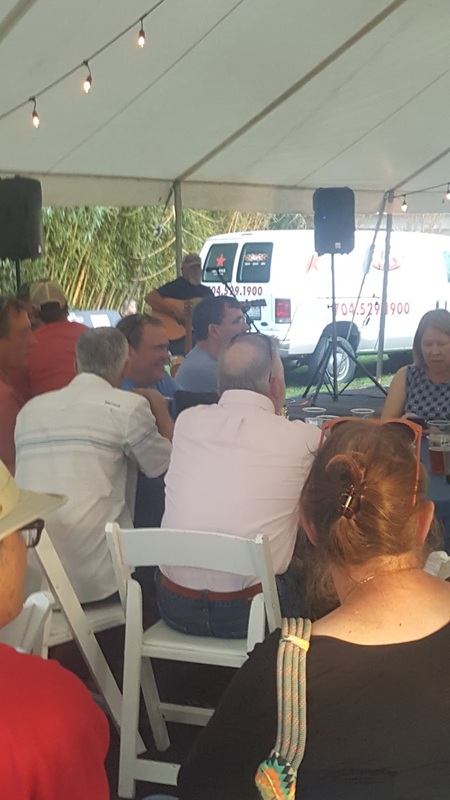 Entertainment was provided by Davidson Mayor Rusty Knox on guitar. Over the course of the evening it appeared a few to several hundred people cycled through the event which was more than expected. Parking was available on site, across Davidson-Concord Rd at a small lot in the new West Branch development, and at the lot by the soccer field at the entrance to River Run. It was also a rare walkable event for people in neighborhoods like Bradford, Bailey Springs, Westmoreland Farm and parts of River Run. In a brief conversation with Knox in between sets, it was clear he was pleased with how the event turned out. It is unclear at this point how often more of these might take place, but it could be as frequent as every other week, weather, scheduling, and continued enthusiasm permitting. Here are some pics of the evening. Apologies for the blurry low-light smart phone photos. aShortChronicle told readers earlier this week that yesterday (Thursday) would be the hotel lawsuit's first day in court and that there was also a hearing scheduled for next week as well. Well, life happens (even to judges), and yesterday's hearing was delayed due to Judge Lisa Bell unexpectedly not being able to be in court Thursday morning. That means the issues scheduled for yesterday will now be heard at the previously scheduled hearing for this coming Tuesday. At this time the Court calendar does not indicate which judge will be hearing motions next week. "The current Board of Commissioners are opposed to the decision to approve the application for a conditional amendment to the master plan for a hotel"
While a detailed analysis of the response will take time, the Town response does admit (at least in part) to some of the allegations in the claims, but on many points it leaves the interpretation of those admissions to the court. The Town does not ask to have the decision remanded to the Town, but if that were to happen the Town would give the project "a fair and impartial hearing based on the facts before it. " Here is hoping they get the chance to do that! DAVIDSON, N.C. – On March 8, 2018, the Davidson Police and Davidson College Campus Police Departments investigated damage to multiple headstones and markers in the Christian Aid Society cemetery located on Ridge Road. A white Chevrolet Impala passenger vehicle was discovered nearby on the Davidson College campus showing signs of damage to the vehicle and oil pan. There was no occupant with the vehicle when it was found, and the vehicle had a temporary 30-day tag. Davidson Police Officer Ramiro Better observed Mr. Lucas traveling 50 mph in a 25 mph zone on Griffith Street at approximately 11:30 p.m. on March 7. When Officer Better turned his patrol car around and pursued the vehicle being driven by Mr. Lucas, the suspect sped off and turned on Beaty Street. Officer Better lost sight of the vehicle and discontinued the pursuit. Mr. Lucas drove down Ridge Road, then proceeded off-road through the cemetery, and abandoned his damaged vehicle near a line of trees by the mechanical shops on Davidson College’s campus. A Davidson College Campus Police officer found the vehicle at approximately 2:30 a.m. on March 8 and had the vehicle towed. Davidson College Campus Police discovered damage to the cemetery around 4:30 a.m. the same morning. The Davidson Police Department appreciates the assistance of the Davidson College Campus, Matthews, and Charlotte-Mecklenburg Police Departments. The Christian Aid Society cemetery sustained damage during this incident, including the destruction of several headstones. If you would like to provide assistance in the form of volunteer hours or monetary contribution, please call Erving McClain, the president of the board of the Christian Aid Society, at 704-896-7729. The legal effort to reverse the approval of the Griffith Street Hotel effort has its first day in court on Thursday. According to calendaring information on the Mecklenburg County Courts website, initial motions will be heard at 10am with Superior Court Judge Lisa Bell presiding. The hearing is expected to be brief, just 30 minutes per the calendar. As an opening move, the developer's attorney has filed a motion to dismiss. That is not a surprising move since the response from the developer effectively denied there was anything wrong with the process that approved the hotel. But now it is not the developer's opinion that matters, it is the judge's. Here is a little about Judge Bell from the court website. Judge Lisa C. Bell received her undergraduate degree from Wake Forest University and her J.D. degree from the University of North Carolina School of Law. Before she became a judge, Bell spent her legal career in private practice. During this time, she also served as an attorney advocate with the Children's Law Center. Lisa C. Bell was elected to the court on November 4, 2014, to a term commencing on January 1, 2015, and expiring on December 31, 2022. She was appointed by Governor Pat McCrory to fill the vacant seat of John C. Martin, who retired Aug. 1, 2014. From August 1, 2014, to December 31, 2014, Judge Bell sat on the North Carolina Court of Appeals. Judge Bell also served as a special superior court judge for the North Carolina Superior Courts from March 2013 to August 2014, a position which she was also appointed to by Governor McCrory. She previously served as the chief district court judge for the 26th Judicial District of North Carolina. In 1998, she became a district court judge for the 26th Judicial District, and in 2009, she became the court's chief judge. Bell was appointed to serve as a special judge on the NC Superior Courts in March 2013. Davidson Springs Public Input Session: Monday, April 9, 5:00 to 7:00 p.m. The public information session will be held on Monday, April 9 from 5:00 and 7:00 p.m. in the Davidson Town Hall board room. All citizens are invited to attend. See also: New Devopments and the "Missing Middle"
Davidson is a town that has long been committed to controlling its own destiny as a distinct, sustainable, and sovereign municipality. Our town’s sense of community is rooted in citizens who respect each other; in racial and socioeconomic diversity; in pedestrian orientation; and in the presence of a liberal arts college. We believe our history and setting guide our future. Davidson remains committed to controlling our own destiny as a distinct, sustainable, and sovereign small town. Our sense of community is rooted in citizens who respect each other, in racial and socioeconomic diversity, and in pedestrian orientation; all in the presence of a small liberal arts college. Our history and character guide our future. 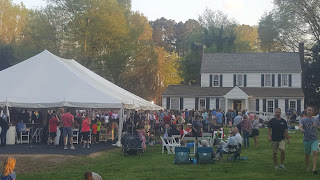 Davidson’s traditional character is that of a small town, so land planning will reflect its historic patterns of village-centered growth, with connection of neighborhoods, preservation of rural area, and provision of public spaces. Davidson is a small, historic, college town. We are a town that celebrates our rich cultural and architectural history. Our unique character is reflected in our land use, managed approach to growth, and preserved in our architectural history. Our land planning will reflect historic patterns of village-centered growth, connections between our neighborhoods, preservation of our rural area, provision of our public spaces, and new development will honor our historic character. Do you approve of the proposed vision statement? Do you approve of the proposed core value #5? Citizens may send emails to the Davidson Mayor and Board of Commissioners at board@townofdavidson.org. Citizens may speak during the public comment period at 6:00 p.m. at the April 10 meeting. Core value #5 will be moved up into the #2 position in our list of core values, although the list of core values is not ranked in priority order. Readers may have started noticing a few of the new silver bikeshare bicycles around town in Davidson. 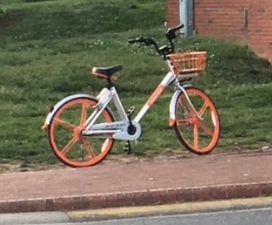 Those are part of the new program launched recently by Davidson College in conjunction with the bikesharing vendor - MoBike. The one pictured here was in front of Summit Coffee's "Outpost" on campus. 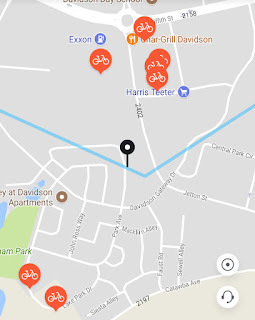 aShortChronicle reviewed the various bikesharing vendors operating in Uptown Charlotte (including MoBike) in this post. Unfortunately, MoBike was our least favorite when it comes to ride comfort, but as we pointed out as well, the MoBike units look the least visible compared to the florescent colors of the other vendors. That will be a good thing as these bikes eventually spread across town. According to Yancey Fouche, Director of Sustainability with Davidson College, the College program has 50 bikes available for rent. Like the MoBike program Uptown, they will eventually cost $1 per 30 minute ride unless the College works out some other deal for students. That's according to this article from the Davidsonian last week after the program's launch. After seeing how these bikes have flooded Uptown, aShortChronicle checked with the Town earlier this week to see if there were any enforcement plans by Town Hall to prevent these bikes from becoming an off campus nuisance As of this writing, the Town has not responded, so it is unknown if there have been any issues so far. From monitoring the MoBike app over the past few days it is clear these bikes are rapidly making their way into the larger community. As of early Friday morning, the app shows 13 of the 50 bikes parked off campus over night. While 50 bikes in the program is not enough to make these bikes the same kind of ubiquitous sight they are in Charlotte, this is definitely something to keep an eye on for now. Readers can download the MoBike app here if interested in trying them. 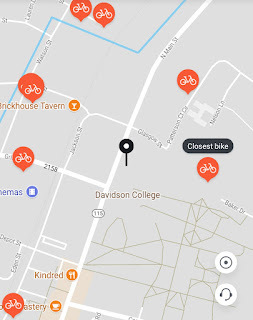 If you see any bikes parked inappropriately off campus and want to file a complaint, you can use the Town's SeeClickFix utility on the Town Civic Plus app. Download that app here. It looks like residents of Davidson will have to wait a little longer to see how the Town will respond to the lawsuit seeking to reverse the approval for the Griffith Street hotel. 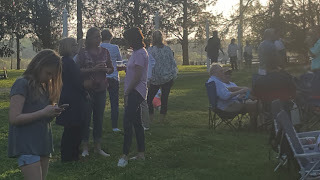 According to information obtained by aShortChronicle, the Town asked for another extension before replying to the claims brought by residents near the project on Griffith Street. This latest request which was granted goes until April 12th. The developer's attorney did respond last week however - submitting a 156 page document, all but 15 pages of which are appendices containing copies of various documents, mostly meeting minutes. In the core 15 pages of the response, the developer effectively denies the claims that there was anything wrong with the process. As one might expect, the developer response was the equivalent of saying move along, nothing to see here. It is interesting to note that the response from the developer denies the claims that anything was done wrong procedurally, but then does not actually specifically address the details of the various claims made by the plaintiffs. How that will play out at upcoming hearings will be interesting to watch. Hearing dates are currently set over the next two weeks to hear various motions. It is unclear at this point if the lack of a response from the Town until April 12th will cause any delays in these hearings. Check back next week for more updates as they become available.